Arsenal will today take on Napoli at the Emirates Stadium and Unai Emery will need to set up his team correctly so that the gunners can get a win over the Italian side who gave Liverpool a hard time in the UEFA Champions League. 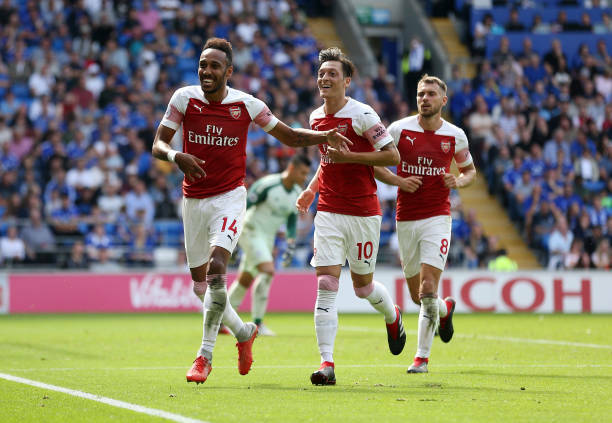 So let us take a look at the predicted Arsenal lineup to face Napoli tonight with all eyes on Mesut Ozil and Pierre-Emerick Aubameyang. Unai Emery has already confirmed that Petr Cech will be the one in-goal in all their UEFA Europa League matches. So the Czech Republican international will once again be in between the goal posts today. Laurent Koscielny has returned to full training and this is good news for the Arsenal fans who wanted Shokdran Mustafi to be benched. Arsenal’s three-man defence will consist of; Monreal, Sokratis and Koscielny. Stephan Lichtsteiner has returned to full training but he probably won’t bench Ainsley Maitland-Niles because the Englishman has been impressive aside from the Everton match. So Arsenal’s wingbacks will be Kolasinac and Maitland-Niles. Most people expect Granit Xhaka to start but he just returned from an injury and so Unai Emery might decide to use Lucas Torreira with Aaron Ramsey in the central midfield tonight. Mesut Ozil will probably start tonight since he is the only central attacking midfielder left in the squad if Aaron Ramsey starts as a central midfielder. So the German international will be behind the two strikers. Arsenal could start with two forwards tonight because Unai Emery has already hint at this in his press conference. Both Lacazette and Aubameyang will be needed to trouble the tight defence of Napoli.